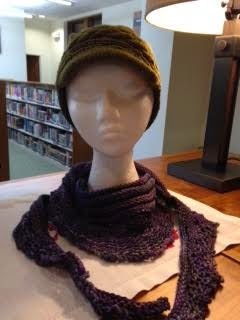 My knitting group, the Knotty Knitters, hosted the First Friday Art Walk at the public library. We had knit hats for Planet Head Day and this was a great opportunity for us to get the word out about this great charity. 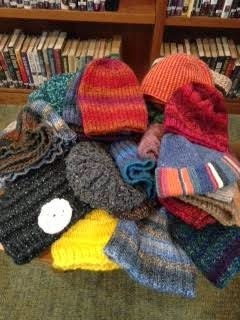 As of Friday night, we had 49 hats knit, but I suspect there are another twenty or so coming. Because I give away almost everything I knit, I didn't have much to contribute to the show, but the photo above has my hat and scarf (on my dummy head). Unfortunately, there were only a couple community members who braved the sub-zero temperature to enjoy the show and the fiddler (a librarian, who's very talented) and refreshments. Love the idea, and that lacy scarf is amazing!